Berkshire Hathaway shareholders returned home from the company's annual meeting this weekend with a much more upbeat report on the company's fortunes during the first quarter compared to the same time last year. 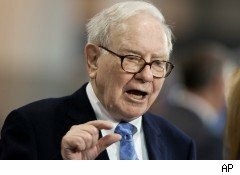 To a cheering crowd, CEO Warren Buffett announced that Berkshire recorded a $3.6 billion profit during the first three months of this year -- a sharp contrast to a year-ago loss of $1.5 billion. The gains reported by the insurance and investment giant, which owns stock in dozens of U.S. firms, were generally linked to improvements in the economy and the company's acquisition of Burlington Northern Santa Fe railroad. But despite the profit turnaround, Berkshire stockholders from around the globe are still nervous about the direction of the stock market and the U.S. economy. Hendrik Leber, a Frankfurt, Germany-based investment manager who traveled to Omaha, Neb., with his wife for the meeting, notes that he's still very concerned about troubles in the real estate market, and as a result, he's very negative on the stock market. "I believe that we will have a second wave of write-downs, especially in prime and commercial real estate," Leber says, also making a grim prediction that there's a "terrible storm ahead of us -- about the same size as the one we've seen so far." Investors attended the annual Berkshire Hathaway meeting in Omaha last weekend. Click through the gallery to see scenes from the "capitalist Woodstock" -- wild ukulele playing and all. Others aren't quite as pessimistic as Leber, but still skittish nonetheless. Simran Suri, an individual investor from California's Bay area, has been a Berkshire shareholder for about four years. On the economy, he says his "biggest concern would probably be that the economy is extremely consumer-driven. It probably needs to get stronger at its core." And until it gains more traction, he's not ready to jump into any more stocks just yet. "There's a huge mess that still needs to be cleaned up," he believes. Over the next six months, he says he'd be more inclined to hold his position before buying or selling any stocks. Ronald Chan, author of Behind the Berkshire Hathaway Curtain: Lessons From Warren Buffett's Top Business Leaders and CEO of Chartwell Capital, a Hong-Kong based asset management firm, is also very cautious, but he applauds what he's seen with Berkshire. Chartwell has held Berkshire Hathaway since launching in 2007, and Chan says "it has outperformed all other stocks [in its portfolio] even during the crisis." Berkshire has also been a part of Chan's personal holdings for more than 10 years. As for the overall U.S. stock market, Chan observes that "as a value investment manager myself, I think everything is fairly priced. I cannot find a lot of value stocks now. . . . Everything is trading almost a little above their historical P/E. And so I'm a bit cautious." In the meantime, Chan would rather hold a little more cash than normal right now. As Suri sees it, many people seem to be "more concerned about the face of the economy, which is the stock market, rather than the guts of the economy." He has a point. While the U.S. economy isn't out of the woods yet, the latest government report on GDP showed that growth at a brisk 3.2% pace in the first quarter, lower than estimates, but still on an upward trend. However, it's easy to see how other mixed signals, including on the housing front, might give some pause. Berkshire investors aren't the only ones looking for better days ahead.